When I first heard about “Radish/Daikon Halwa” , I was really sceptical about the taste and was wondering about the “famous” smell of daikon !! But when I tasted it for the first time , I was so amazed by it’s taste . No smell and tastes divine . 1. Grate the radidh finely and squeeze out all the water from it. 2. Boil it in boiling water for 5 minutes . Drain out all the water and squeeze out the water again . 3.Now cook radish with milk , cinnamon and cardamom until dry . When the milk dries out add the sugar and ghee . Stir continously until the water from sugar dries out . Mix the maowa/ khoya . You may sprinkle keora water ,if you wish . 4. Garnish with chopped nut and maowa/ khoya . 1. You can make maowa or khoya with powder milk too . Mix Powder milk with liquid milk and little ghee . And microwave for 30 seconds-1 minute or until dries out . 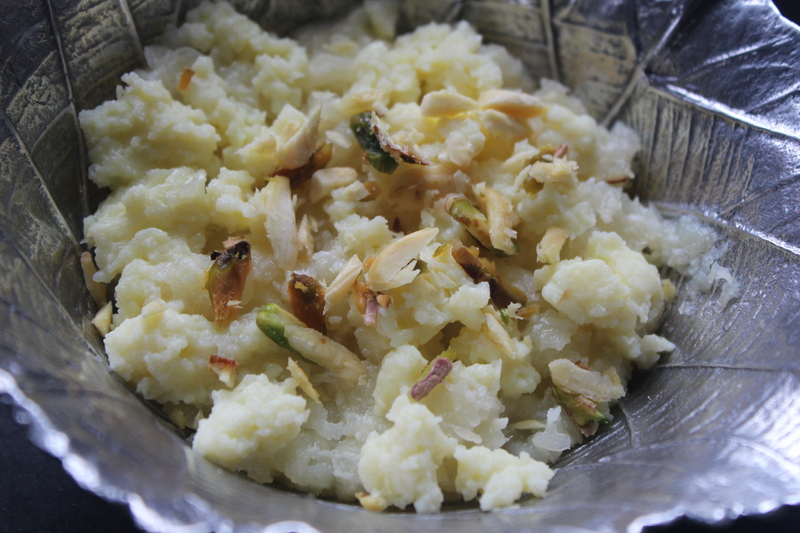 This entry was posted in Desserts and tagged daikon halwa, muki halva, mular halua, mular halwa, Muli halwa, radish halwa. Bookmark the permalink.